Fascinated with tea? Perhaps looking for somewhere peaceful during your Sri Lanka experience to recharge the batteries? 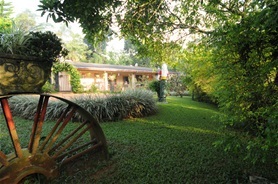 We offer Bungalow type accommodation that allows you to enjoy the serenity of the surrounding Tea plantation. We are more than happy to show you the entire tea process where you can even enjoy a cup of tea you helped produce. Your taste buds will be swept away by the home cooked authentic Sri Lankan cuisine as well as our western style cookery. It will feel like home the moment you arrive at Ebony Springs.